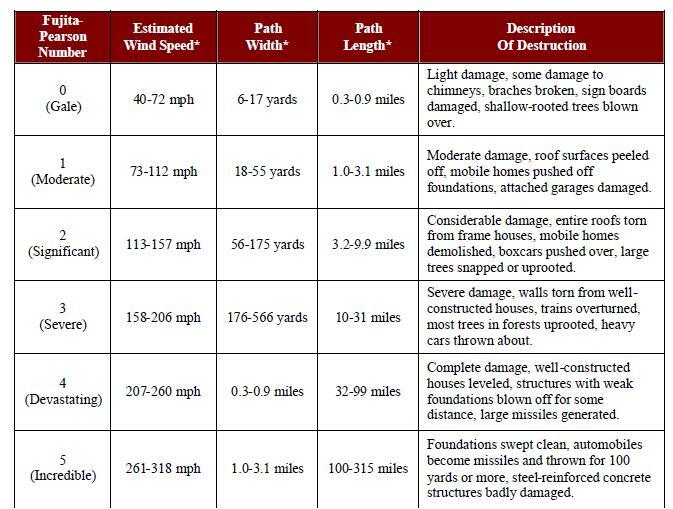 Precipitation / drought / tornadoes / storms are the focus of this document. 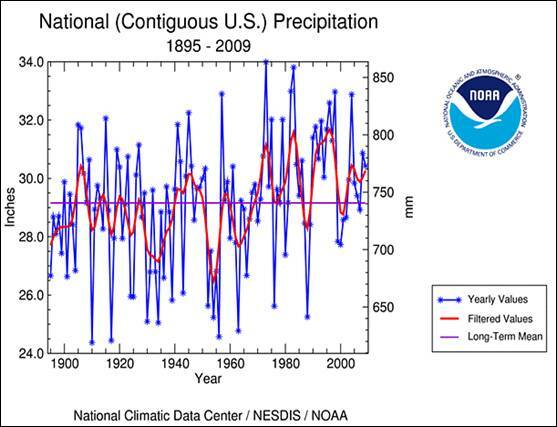 The following figure shows US precipitation for 1895 – 2009 [http://www.ncdc.noaa.gov/sotc/get-file.php?report=national&image=ann/timeseries01&byear=2009&bmonth=01&year=2009&month=12&ext=gif&id=110-00]. 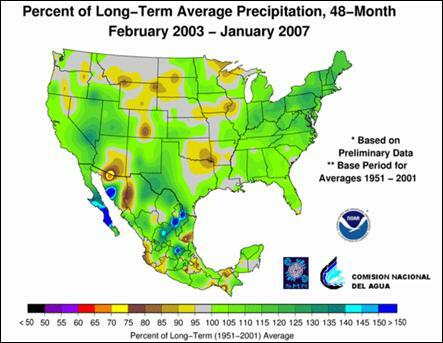 The following figure shows precipitation anomalies for Feb 2003 to Jan 2007. 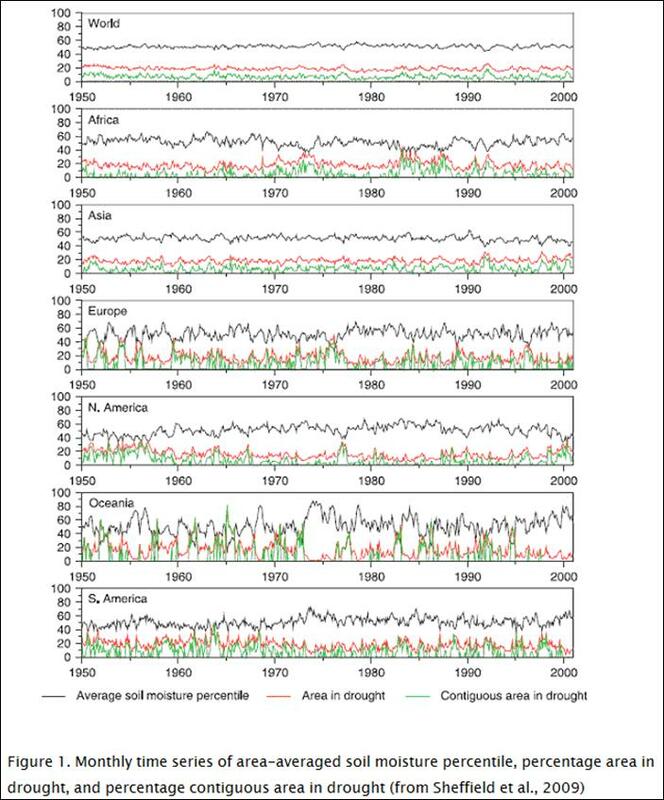 The following figure compares the occurrences of moderate to extreme drought and moderate to extreme wet conditions in the US Feb 1990 to 2006. 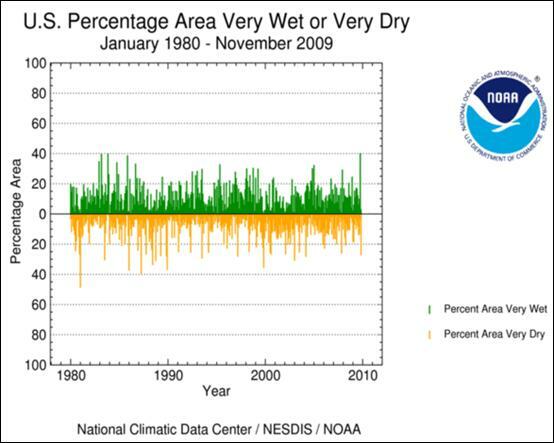 There are always some areas in the US that are experiencing drought or extreme wet, as indicated in the above two figures. The following figure shows the change in drought severity from Sep 2007 to Aug 2008. Drought in southern California and Arizona has lessened, while drought in Texas and Georgia has worsened. The following figure shows precipitation trends on a regional basis for 1900 - 2005 [http://www.ncdc.noaa.gov/img/climate/globalwarming/ar4-fig-3-14.gif] Areas in grey on the map have insufficient data. 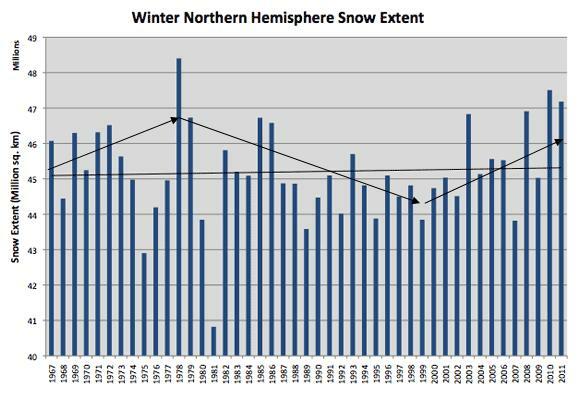 The following figure shows northern hemisphere snow cover for late January from 1967 to 2011. 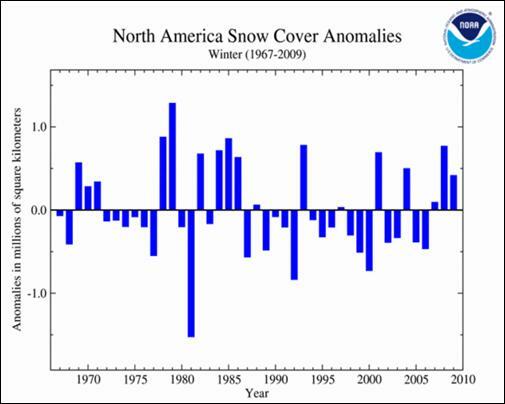 The following figure shows North America snow cover anomalies since 1967. 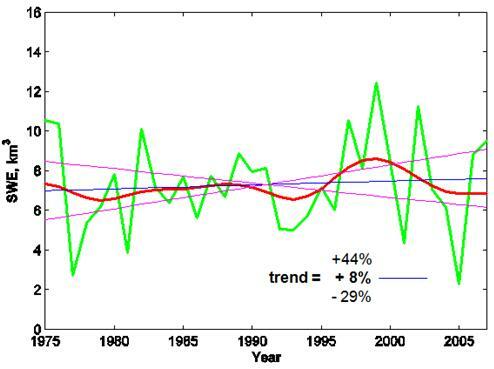 University of Washington researcher Mark Stoelinga has studied the Cascade snowpack and concludes “Snowpack trend since the ramp-up in global temperature in the 1970s is slightly positive” [ftp://ftp.atmos.washington.edu/stoeling/presentations/PNWWW_2008_Snowpack.ppt] The following figure from Stoelinga’s research shows the Snow Water Equivalent (SWE) for the Cascades from 1975 – 2007 (April data being designated as the critical timeframe for snowpack). See: http://www.appinsys.com/GlobalWarming/RS_Washington_usa.htm#snowpack for more details about Cascade Mountain snowpack and precipitation in Washington State. 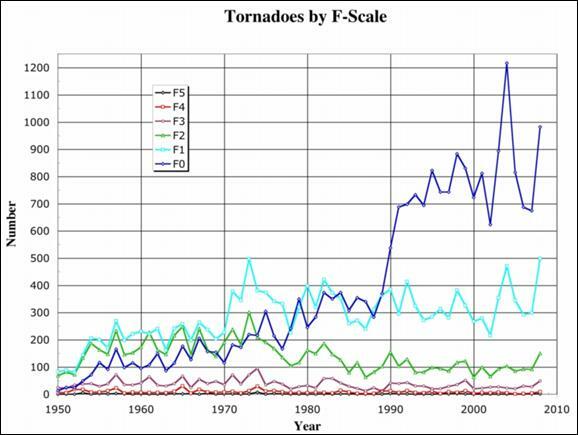 NOAA has reported the number of strong to violent (F3-F5) tornadoes each year in their annual climate summary report. 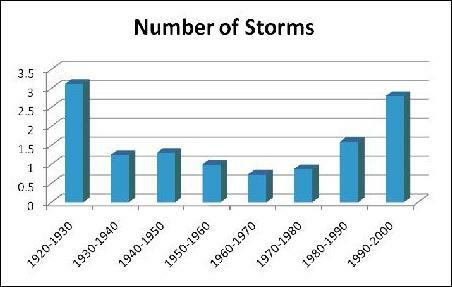 The following graph is from 2008, showing a decline in strong tornadoes over the last 50 years. But in 2009, under Obama’s administration, the method of reporting tornadoes in the annual report changed so that the situation could suit the administrations goals. The following figure is from the 2010 report showing the tornado count, rather than the number of strong to violent tornadoes. The increasing tornado count is due to improved weather tracking technology. In the 1950s radar began to be used; then in the 1970s, Doppler radar improved the detection capabilities. The number of F0 tornadoes reported has increased greatly as monitoring technology and reporting has improved. 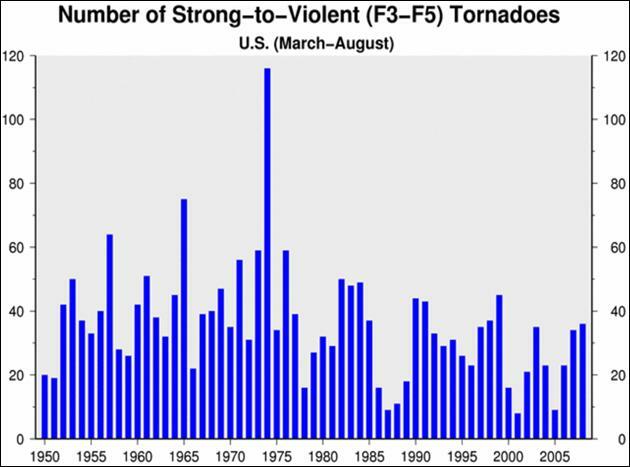 The number of strong tornadoes (F2-F5) has not increased, since these have been more accurately counted all along since 1950. The following figure compares the tornado fatalities (from http://www.ncdc.noaa.gov/sotc/national/2008/ann]) as representative of very strong tornadoes, with the Multivariate El Nino Southern Oscillation Index (MEI – from [http://www.esrl.noaa.gov/psd/people/klaus.wolter/MEI/]). 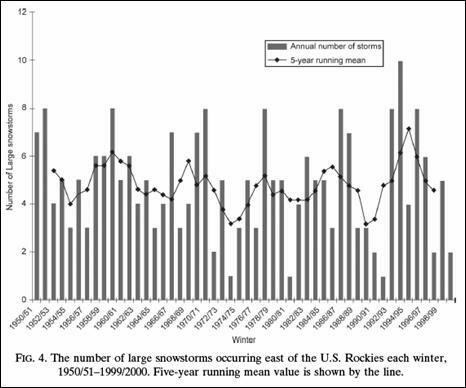 It is clear that the years with violent tornadoes are years with extremes in the MEI – usually on the La Nina side of the ENSO. 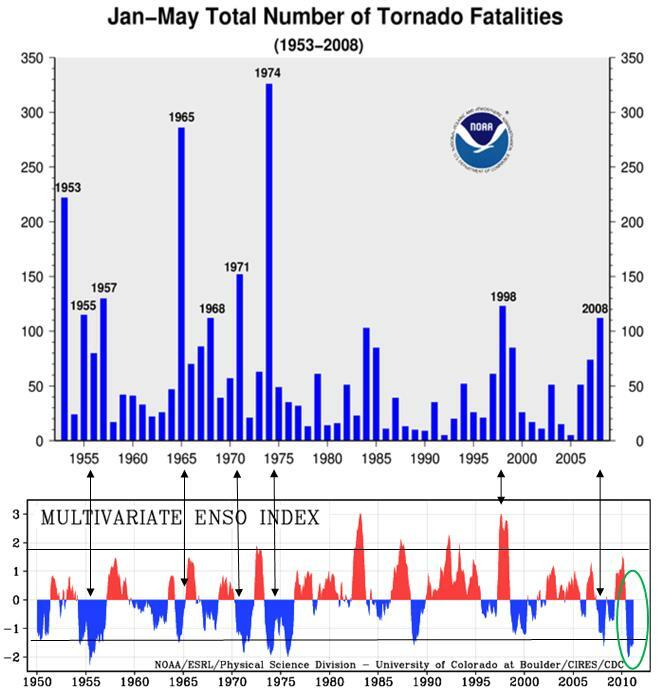 The tornadoes in 2011 also correspond to an extreme La Nina as indicated by the green circle above. 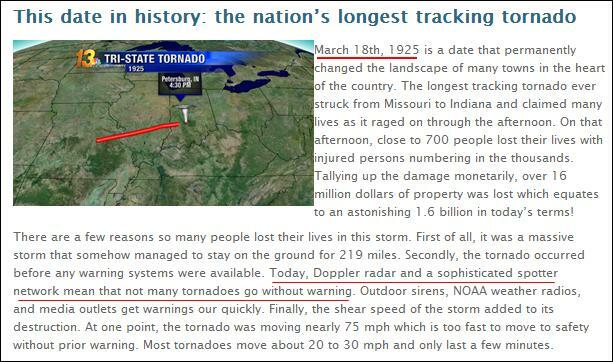 The storminess of the 1990s is exceeded by the storminess of the 1920s. The following figure shows the Colorado River flow for the past 100 years [http://pubs.usgs.gov/fs/2004/3062/]. 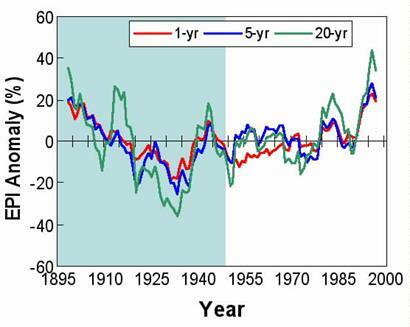 There has been continuous decline of the flow since the 1920s – obviously not a result of CO2. 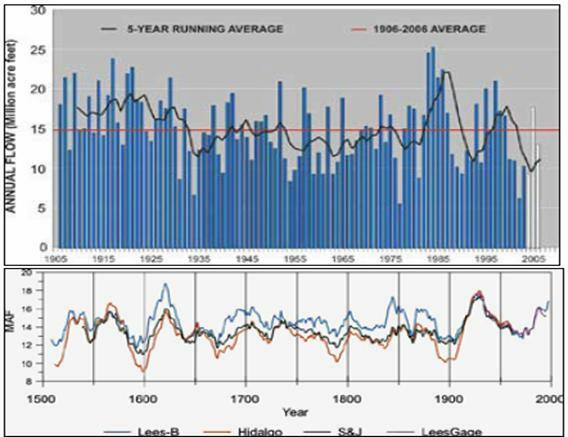 The following figures show Colorado River flow for 1905 – 2005 (top) and 1500 – 2000 (bottom) at Lees Ferry. 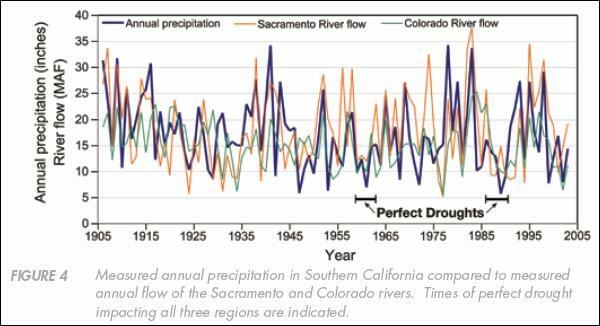 [http://dels.nas.edu/dels/rpt_briefs/colorado_river_management_final.pdf] Putting the 20th century data in long term perspective shows that the river has gone through similar cycles in the past. 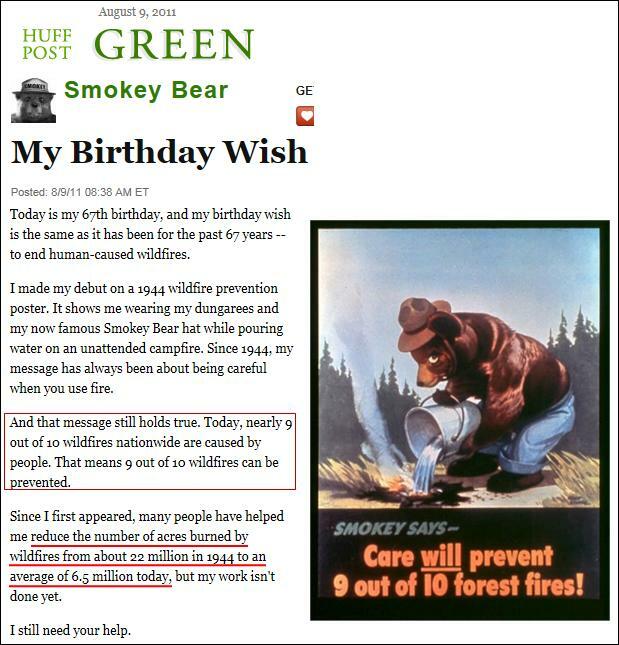 Increased wildfires in recent years are often blamed on global warming. However, droughts occur in cycles and the forestry management practices have also resulted in increased fires. “Twentieth-century wildfire suppression and land management policies have promoted biomass accumulations in some ecosystems in the western United States where wildfire is a natural and necessary element.These changes have fueled large,stand-replacing crown fires in southwestern ponderosa pine forests, where they were rare under natural fire regimes.” The following figure is from that study. 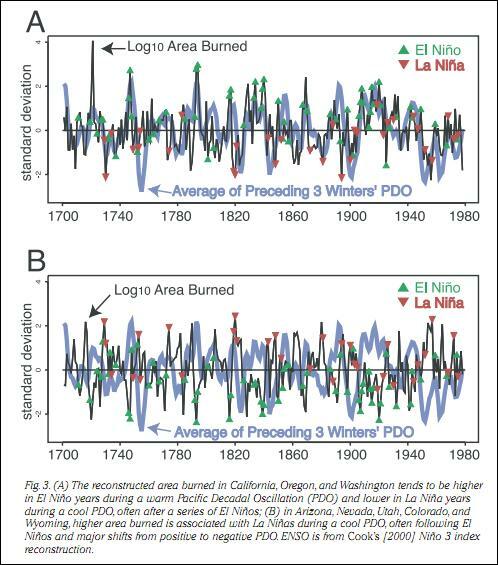 The west coast area (figure 3 A) shows a very high correlation with the El Nino / La Nina events. 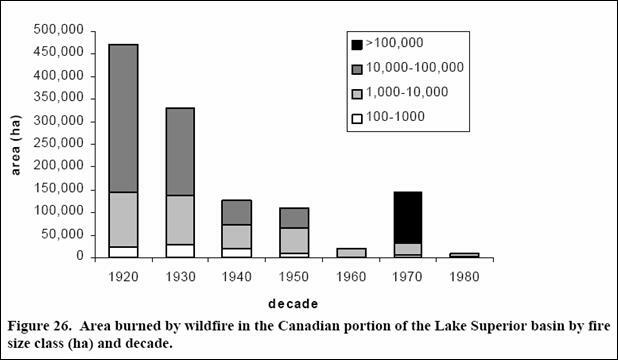 The following figure shows trends in forest fires in the Canadian portion of the Lake Superior basin.